Dimensions 3 by 7.25 by 12 in. Amazon.com description: Product Description: When Lisa hangs her woolen clothes in the sun to air them out for winter, the hedgehog, to the amusement of the other animals, ends up wearing a stocking on his head. 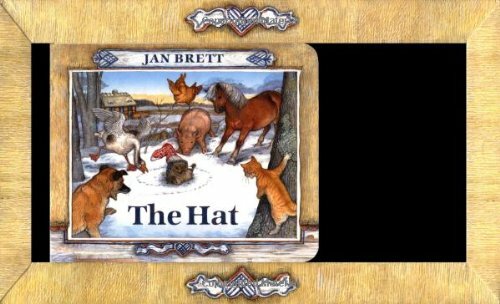 Board book edition from Putnam Pub Group (October 18, 2016); titled "The Hat"
About: A delightfully original companion book to Jan Brett's bestseller The Mitten. Board book edition from Putnam Pub Group (September 1, 2002); titled "The Hat"
About: When Lisa hangs her woolen clothes in the sun to air them out for winter, the hedgehog, to the amusement of the other animals, ends up wearing a stocking on his head. Har/toy edition from Putnam Pub Group (September 1, 1999); titled "The Hat"
from Putnam Pub Group (September 1, 1997); titled "The Hat"